When I last saw Oculus's standalone Santa Cruz headset, it was more of a mock-up, with exposed circuitry and wires held together by tape. One year later, back at Oculus Connect, I got to try the headset again – but this time it felt almost ready to ship. I wasn't allowed to take photos, but the Santa Cruz looks very similar to the Oculus Rift we know. First though, we need to talk about what Santa Cruz actually is. This is not the Oculus Go, the company's other standalone headset. The Go is a more compromised experience – better than GearVR but with three degrees-of-freedom tracking and lower specs than the current Rift. Santa Cruz has much more grunt; 6 DoF tracking, better graphics, controllers that are much more like Touch. It's a standalone headset that comes closer to the might of the Rift, but no computer required. Total freedom. That's not to say it'll be without limits, but after playing with it for a short while I can tell you the experience was excellent. Santa Cruz looks just like the existing Oculus Rift but with small sensors around the front of the goggles. These are to track your location relative to the room, and in a talk at Connect Oculus showed a video of headsets being dropped on the ground to demonstrate why it used recessed sensors to protect it against fall damage. There's also built-in spatial audio, which sounded really good in the controlled demo room, and meant zero fumbling with headphones (even the Rift's built-in ones need a little adjusting when you put it on). Then came the controllers, which have had the biggest cosmetic change here. While the plastic loops on Oculus Touch are inverted to wrap around your hands, the Santa Cruz wands stay level to it, making it easier for the headset to track them and allow that full freedom of movement. My first demo, a game in which I was playing fetch with a bizarre dragon-dog thing, was a good excuse to test this out. As I hurled sticks and bits of fruit for my new pet, the tracking stayed smooth and locked. The joystick has also been replaced with a touch-sensitive pad which will allow more versatility. An Oculus rep told me that it just wants to see what the developers do with this. So did this mean I could go totally AWOL and start leaping on the couches? I tried, but the Oculus reps quickly informed me I was still inside a virtual play pen. There's still a guardian system here that developers will set, and when I went too close to my boundary the familiar blue grid faded in. In the second game I played, set in a space station, my play area felt a bit larger, and on more than one occasion I second-guessed myself when the developer told me to walk across the room and pick up a key. Without a tether serving as a constant reminder I was in a matrix, as I stepped across the glass floor above the void below the fear started to kick in. This question of space constraints could prove to be an interesting headache/opportunity for developers, as they think about how games might scale to different environments. If I take my Santa Cruz headset from my living room to a friend's house, how will it work? In the earlier talk, Oculus VR game designer Katie Chironis even pondered designing in-game environments that change shape according to how much space is around them. This is just one of many lingering questions – the other major one of course being price. A problem I see with Santa Cruz, especially if it's very expensive, is that it risks becoming obsolete faster if the internals can't be upgraded like a PC can. The Oculus team couldn't answer a lot of my questions, but did confirm the Santa Cruz experience is totally standalone, so you won't even need to have a computer to use it. We also have no idea what the specs will be yet, nor a final name. 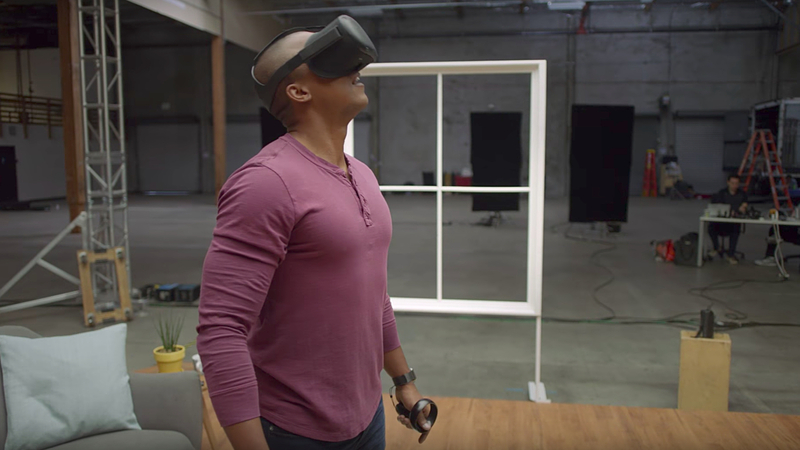 Oculus told me that Santa Cruz is just the project name, so start your guesses now. But Santa Cruz is a virtual reality experience more like the one we were promised. This is the next level of room scale, so much less compromised. The technology is almost ready, but it's what developers do with it that I'm most excited to see.